Climb Europe's highest mountain, Mt. Elbrus (18,481' / 5642m) !!! 20% off !!!! Itinerary, dates and land cost - 2015. !!!! 20% off !!! Report - Seasons of 2007 - 2014 year. Notes of climbers about us. Ski from Mt Elbrus, 5642m. NEW - In 2012 we now offer specialty tours for Painters/Artists visiting Russia. My name is Nikolai Savin. I am the owner and lead guide of Alptour, an adventure company which has managed tours and guided on Mt. Elbrus for 17 years. We organize groups and individuals for hiking and climbing on Mt. Elbrus with logistics originating in Moscow and St. Petersburg. Our services include visa support, hotels reservations, permits, expert guides, ground transportation, domestic flight assistance, climbing gear rental, food and all other logistical arrangements. 1) You choose where you want to paint and we will arrange all of the supplies and support for you. 2) If you prefer, we can recommend some of our favorite painting spots. 3) You can paint with your own group assisted by an experienced art teacher. 4) You can join a group with teachers for beginners or intermediate painters. 5) Your special requests can be provided. 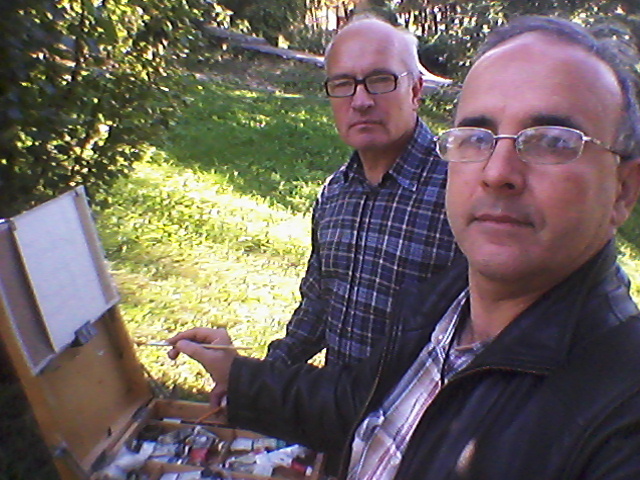 Since 1996 Rail Davletbaev has been a teacher at Moscow College and Secondary of Russian Art Academy. He teaches children, students and adults.